Most of the information here is from Pastscape, but I have brought the details of every WWII heavy anti-aircraft battery site around Manchester (to my knowledge) together on one single map for anyone who might be interested in this sort of thing. Google map links (just zoom in or out) and Ordnance Survey Grid References below. I don’t know what, if anything, is remaining at these sites. Many now have been built on but some may show visible traces on the ground. Link the number on the map to the detail below. They are not arranged in any particular order. 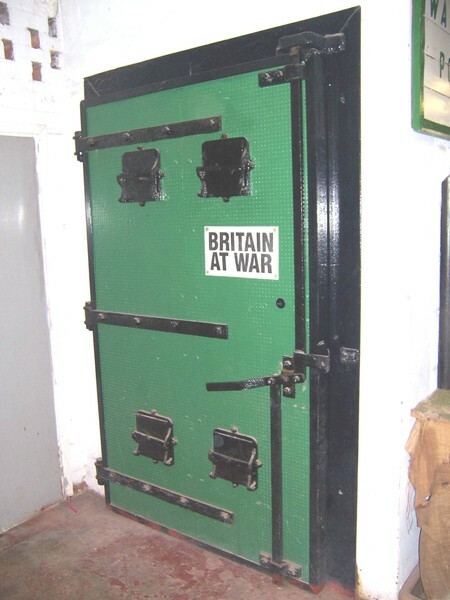 I am grateful to George Cogswell for information and his photographs of an outer blast door – one in situ and a photo of the same as it was having been recovered and displayed in his museum (which no longer exists) – from an underground munitions store at Altrincham. George advises there was an anti-aircraft gun emplacement across the road from the munitions store at John Leigh Park. 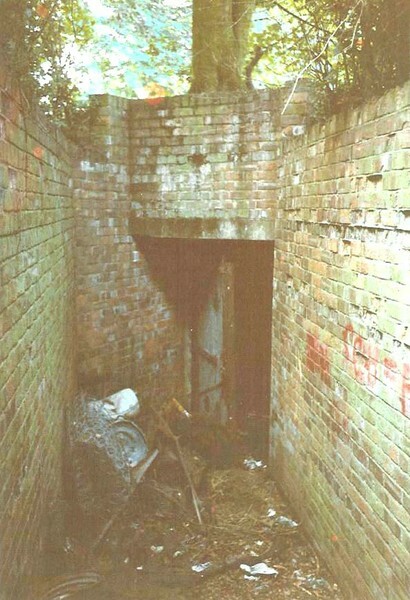 This AA gun emplacement is not mentioned on Pastscape, which probably means there are other such sites around Greater Manchester; as stated above, the details provided are only those I have knowledge of. The munitions store was at a point where the Oldfield Road bends to the left coming from the direction of the A56 and there was a ramp down to it. The site is now beneath a new housing estate. Photos used with kind permission of George Cogswell. His websites are here. Nice work mate, fairly sure there’s a (big!) book listing these – I’ll have a trawl. This is fantastic work Ian..I’ve lived at Besses and Whitefield and of course, Salford..Wonderful to see. 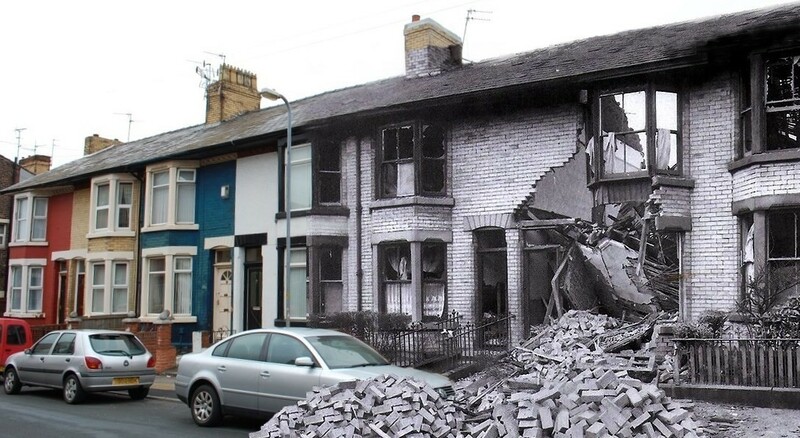 [http://www.flickr.com/photos/maycontaintracesofnuts] wow. i’m impressed! and i have a history of being thorough to the point of obsessive. i think maybe i’ve found someone that’s actually better at that than me!! I’m quite overwhelmed by it all. Manchester doesn’t make it to the coast? What’s to the west. [http://www.flickr.com/photos/angwickham] Thanks Ang too. This isn’t a typical Flickr upload, no photo for people to look at and comment on, I wouldn’t expect most people to be interested in it. It was a paiin to do, but am glad I have. I can use it as a base and add other details to the map in future as well. Liverpool is to the west by the way, but Manchester is a port because of the Manchester Ship Canal and the docks at Salford and the warehouses in the centre of Manchester which attracted the bombers. You could have a treasure hunt…. first to visit all the sites is the winner. Would be kinda fun…… I think I’d win. It must have been a lot of work, Ian! Well worth the effort though, it’s a great documentation. If there were only field heavy a-a gun emplacements, I wouldn’t expect to see any remains today. But, while looking at the google maps links it puzzled me that the original gun batteries locations haven’t been built-up until today. By the way, have you seen Vienna FlaktÃ¼rme? Very informative, are there any remains do you know? [http://www.flickr.com/photos/maycontaintracesofnuts] i know what you mean – my whole nznatives stream is like that – purely reference for me! [http://www.flickr.com/photos/stiemer] I have no idea, need to take a look! [http://www.flickr.com/photos/bazylek] Thanks Robin, yeah have seen photos of that. It is an impressive structure! There were a couple in Berlin, I think one is still there? 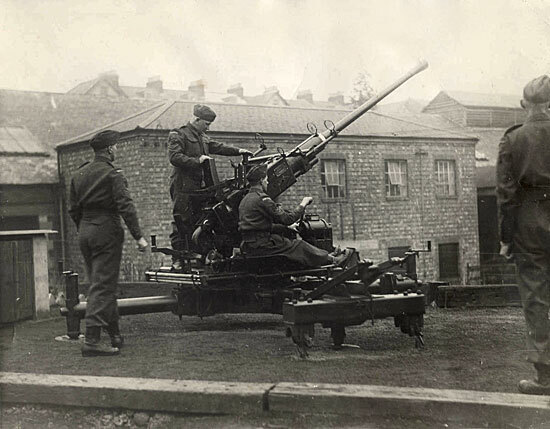 My Grand Father was on the Rusholme Battery, and he told me they never fired in anger because of the Percussion damage. 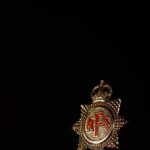 positions,especially around the Irwell valley,Agecroft area? For a great photo of Bank lane Heavy AA battery,go to “Britain from above”and search “universal metal”.For a pic of”Crofts bank Heavy AA battery,search “Ford Shadow factory”,also some bomb craters and etc.The shadow factories were the production line for the Merlin Engines,the test bays can clearly be seen at both Davyhulme and Barton Dock Road Plants. Thanks Rick. Will take a look later for barrage balloon positions. Not sure what there is on the internet but I will have a look in my books and e-mail you if I find anything. Britain from Above is a terrific resource isn’t it! I’ll have a look for Ford shadow factory as you suggest. 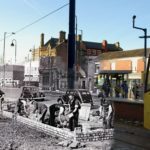 Lots of WWII history around Barton and Trafford. Hi mate where in the barton area out of interest? Hi Ben, at the industrial park and what is now trafford centre, there was lots of essential war work going on – aircraft built at Metro Vicks and Merlin engines built at Ford I think, all industry linked to the sea by the canal. Subsequently the town was heavily bombed by the Luftwaffe. At the end of the War my Dad – who had fought in North Africa and been a POW in Italy/Poland – was talking to a guy in uniform in the bar next to the Palace Theatre on Oxford Street. He said he had been on AckAck duties – on the roof of Hulme Barracks – for most of the War. Would this have been a Heavy Anti Aircraft Battery? Hi Michael, that’s likely to have been a light AA gun, a 40mm Bofors gun or a smaller calibre 20 mm Oerlikon if sited on the roof. 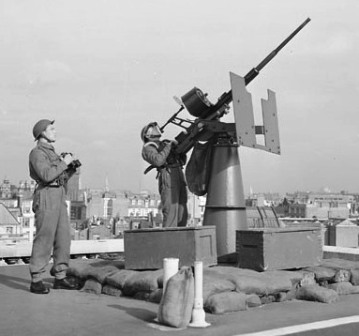 Heavy AA guns were of 3.7 inch (94mm) calibre. It is possible the man was a spotter, watching for German bombers coming close to the barracks so that soldiers would be able to work through an air raid alert in the general area and only take cover if bombers were heading straight for them, which happened more than we probably imagine, most people worked through air raids when a firm had roof spotters. But given it was a barracks, I’d imagine it was a light AA gun. Photos below show two light AA guns and a heavy AA gun. Great work! I’m interested in the Prestwich area. Wondering if an AA gun and a balloon be positioned together? I’d be interested in more info regarding the positions in Bessess and Whitefield (1&2) on your map if you have any. Come to think of it, I know exactly where the Philips park balloon was as there’s still a concrete lump in the field there. This map shows the red range marks from the gun position. Hi thanks for your comments. Am not at home at moment but will have a look around later this evening see if can find any more info for you. Did you say there was a map link that didnt work? No rush whenever to you have the time. The map link that i had trouble with is on my other comment on another thead. There’s a link to bomb sites which takes me to Mcr Uni library and it needs a login to access it. Hi Rick, do you have any more info about what went on at Overdale House? Hi Rick, which field near the 7 arches was the balloon in? I’ve dragged together some info (from above & from elsewhere on the web) onto this map of the Prestwich area. I also borrowed a copy of AA Command via the library. So I can see that the Prestwich AA position was listed in there as Besses, although the map ref points to Prestwich Heys. It also says the map refs are converted from the “Cassini” grid system into OS grid refs claiming accuracy to 100m if you’re tracking any of this down on the ground. 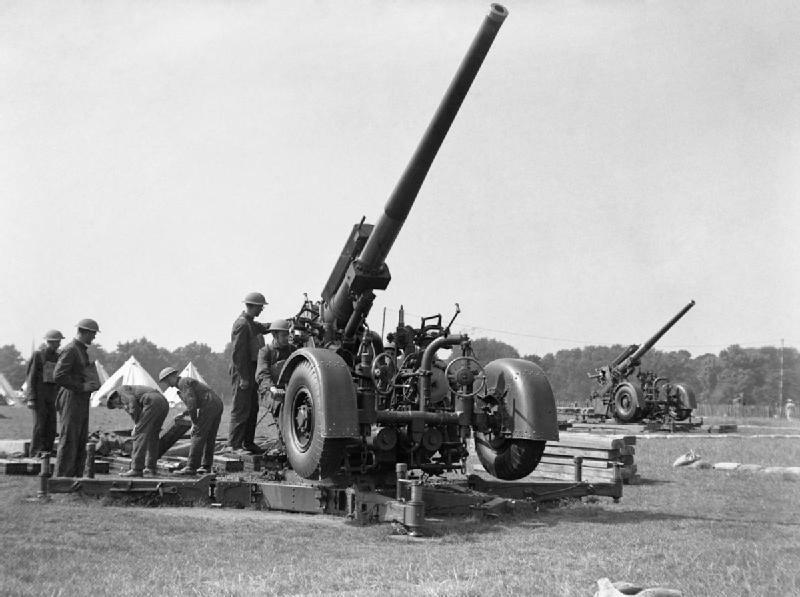 My father was based at Salford, Heavy Anti-Aircraft Battery near the start of the war before heading off to Ceylon, Egypt and Italy. Left January 1942 to go to the Far East from Liverpool. I think they were heading to Singapore but re-routed after it fell to the Japanese. He’s been dead almost 30 years now, but did write about walking down Bank Lane and turning left into Park Lane to get to the camp. Any more info/photos of the area for that period would be much appreciated. I think the year before he died (1987), he took a walk down memory lane, as he expected much had changed. He joined the Royal Artillery Territorial Army in Edinburgh in Feb. 1939 at the age of 18 and I think he was posted there shortly after the outbreak of war.